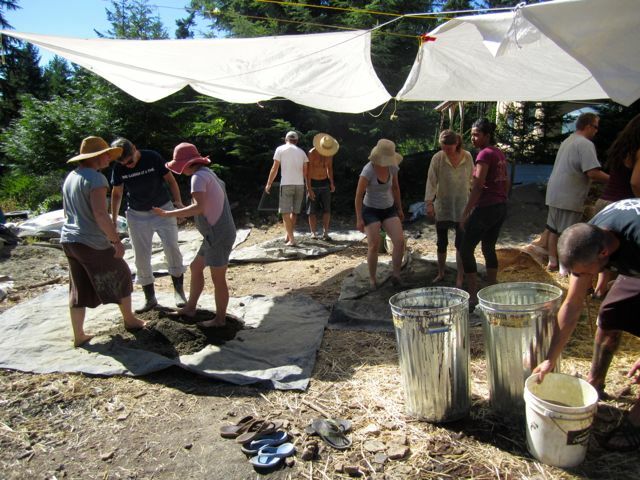 I spent part of last week at a workshop offered by the Mudgirls, a natural building collective in British Columbia. 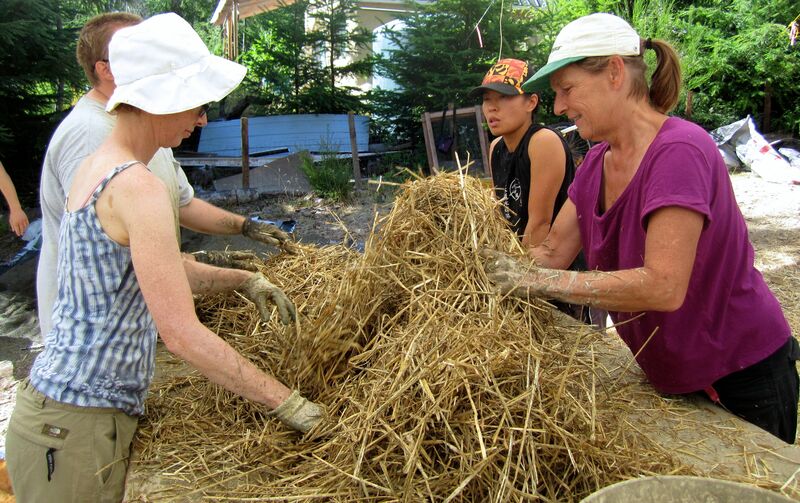 The Mudgirls strive to live lightly on the earth while sharing skills among themselves and the wider community. 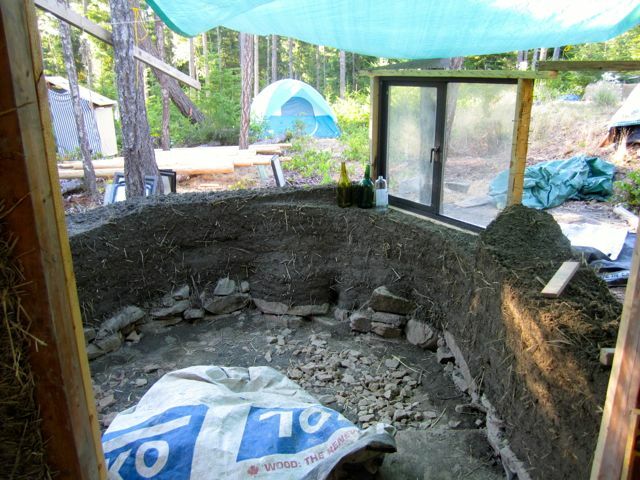 And when it comes to resilience, building shelter from earthen materials is about as serious as you can get. 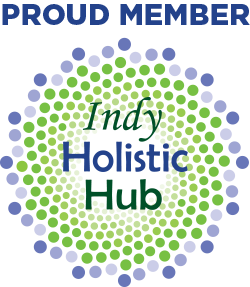 This is a group that embodies the reimagined world, and a powerful DIWO (do-it-with-others) spirit. The Mudgirls do their work in child- and mother-friendly style. Collective member Rose hosted our workshop on cooperatively owned land on Denman Island. We camped in the forest by night and bartered our labor for instruction by day. About 15 others took part, bringing enthusiasm and good humor to the work. 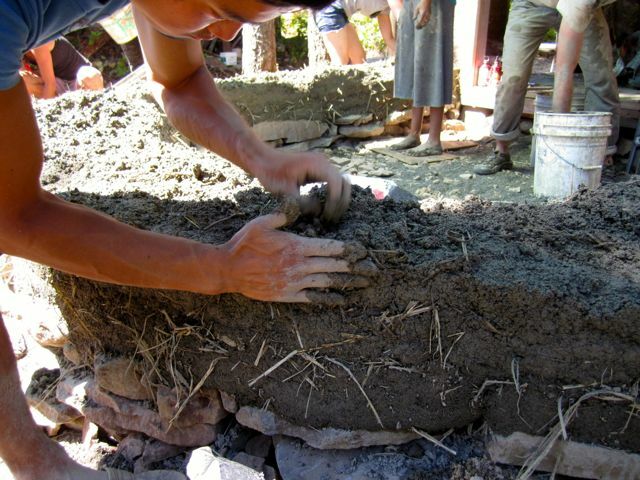 Some of our group making cob, a mix of clay, sand, straw, and water. Rose is converting an existing structure on the land into a home for herself and her family. 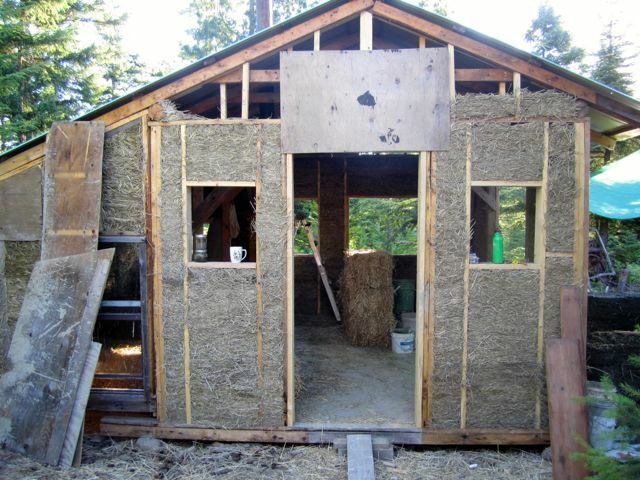 Using temporary plywood forms, we packed the walls with insulating material called slip straw. 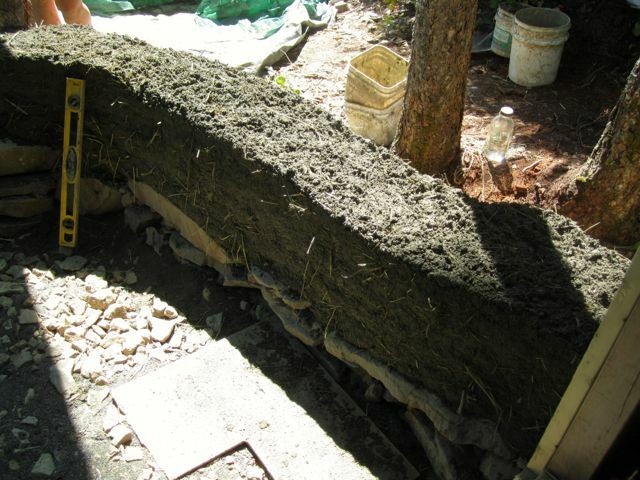 We made this insulation from straw and a clay-and-water slurry. In a few weeks the walls will be dry enough to plaster. House with slip straw insulation in the walls. The plywood is temporary, just to create a form to pack the slip straw in. We all helped mix the cob, which is a blend of clay, sand, and water, with a sprinkling of straw. While clay has compressive strength, it lacks tensile strength–the role of the straw. We learned that the straw has a similar job as rebar in concrete, adding internal structure to the dense material. Mixing a batch of cob. Building the wall was perhaps the most exciting task. Some people made it look easy. But I’m still not sure the section I worked on could be called plumb! Room addition taking form, with window. 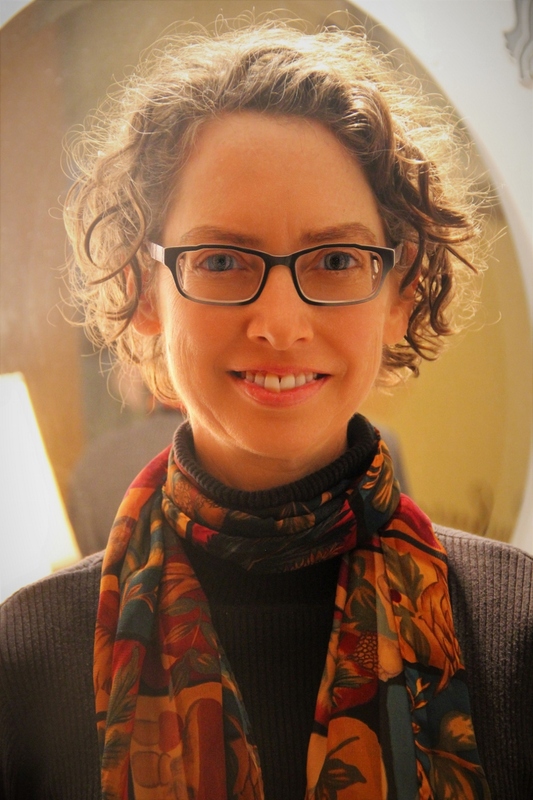 I asked Molly, one of the Mudgirls who helped with instruction, how the Mudgirls mission fits into the broader picture of ecological and societal upheaval. Beyond her passion for natural building, she told me, what excites her is the community that’s being nurtured. 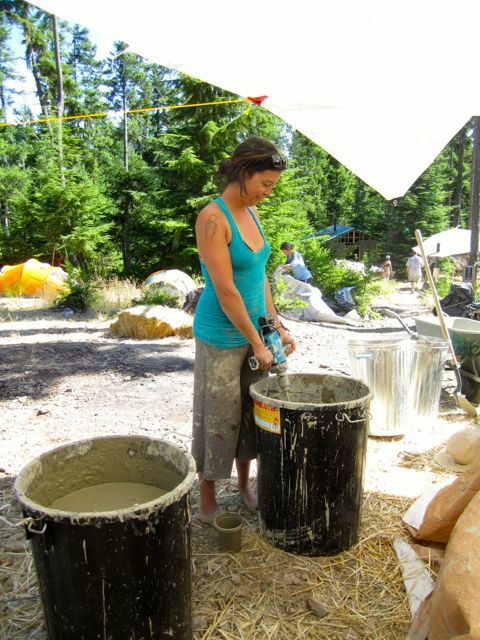 Molly mixing clay slip with a giant eggbeater-type tool. The women of the collective have known each other for years and have a solid commitment to each other. They make decisions by consensus, taking the time to talk things out (though in recent years the talks are shorter as the big issues have been resolved). Members all know that they have each others’ best interest at heart, and each agrees to take responsibility for her own needs and desires. 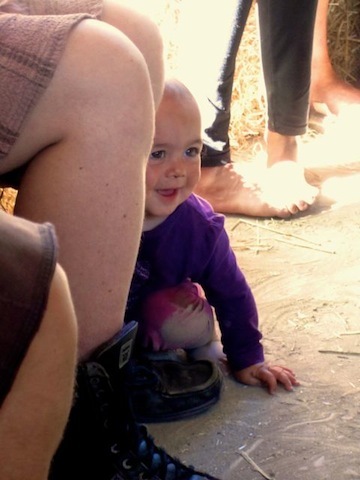 Molly said that people who come to workshops often reconnect at later events, forming lasting friendships. So community extends beyond the core collective. 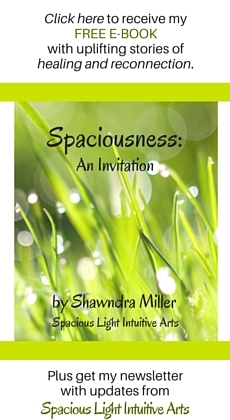 She sees participants as pollinators, taking our inspiration beyond the islands of British Columbia. 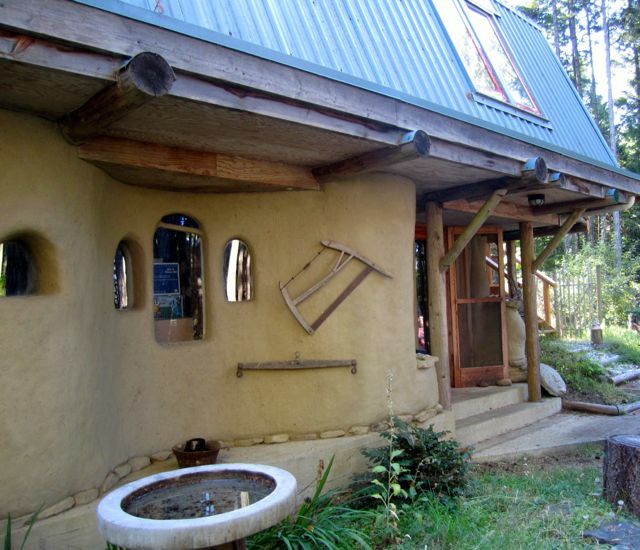 Example of a finished cob exterior. For me the experience was all about the freedom to try something new. I had to grant myself compassion for the learning curve, and work on forgiving my body its frailties. The Mudgirls’ supportive environment made that possible. And it was thrilling to help build an actual home. These hands that spend so much time on a keyboard are part of Rose’s homestead now. 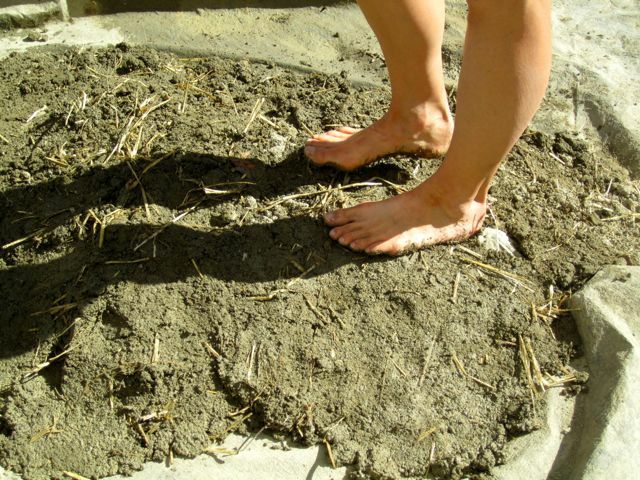 This entry was posted in Community, Homesteading and tagged British Columbia, Carbon footprint, Cob, consciousness shift, Denman Island, DIWO, DIY, Do it yourself, Do-it-with-others, Environment, Mudgirls, Permaculture, resilience, Small but Mighty, Sustainability, Vancouver Island. Bookmark the permalink. love it Shawndra, and what a beautiful structure – what a unique experience, thanks for sharing! What a great experience – heart, hand & soul!!! Thanks for sharing! Thanks, women! It was a terrific experience. This reminds me of the bousillage that filled the walls of traditional homes during the French period in North America. They would, of course, have parties for the making of the bousillage. In Vincennes, it was made of clay and prairie grass (it filled the spaces between the vertical timbers, which also had ladder-like batons between them to hold the bousillage). That’s fascinating! Thanks for sharing. Yes, the permitting situation is certainly a barrier. It’s a shame that solid, affordable housing is out of reach for people in the States because of that.